"Is my picture a signed, limited edition or an original painting..?" The printing industry states that when a specified quantity of prints are produced from an original printing plate; then this is usually the only ever edition produced; unlike books which often are published several times. The print is then numbered eg. 23 out of 850 and/or stamped by the publisher or the Fine Art Trade Guild (who no longer offer this service), and signed personally by the artist; usually in pencil which resists the fading that is often associated with biro, felt tip, and ink, due to the UV light. Original print, artist's proof, reproduction print, limited edition print, all go to create an air of cunfusion on this subject. Etchings, engravings and woodcuts were amongst the first methods of printing. These techniques were very 'hands-on' and laborious; The prints produced were often in runs and due to the type of printing process, no two prints were exactly the same. This where the term 'original print' originated.. The usual quantity produced in limited edition etching was 100, and for a dry point 10 to 20. As technology increased, original works of art could be accurately reproduced in high quality using a photographic process. A few extra copies were always produced and signed as artist's proofs (AP). These were generally less than ten percent of the edition total. 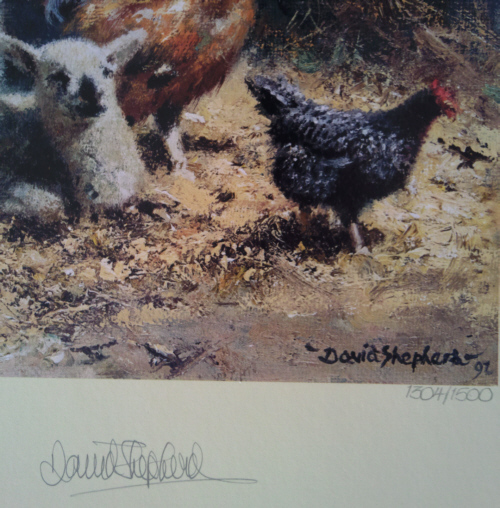 A signed print has been signed personally by the artist; this is not the signature that has been printed with the image , from the original painting. The original reason for the artist signing the work was to confirm that he was satisfied with the quality of reproduction that had been achieved. Provenance is quite simply a record of history and therefore a guarantee of authenticity; It is not generally necessary to have provenance for a print, and these days a Guarantee of Authenticity for a print is more for sales, than the practicality; Original drawings and paintings require much greater provenance. Which can be simply in the form of a bill of sale.. Giclee prints are quite simply, prints from original work that has been scanned by a computer and then printed onto paper or canvas using a high quality digital printer. Some of the world's finest watercolour paintings can be seen at Sir William Russell Flint art.